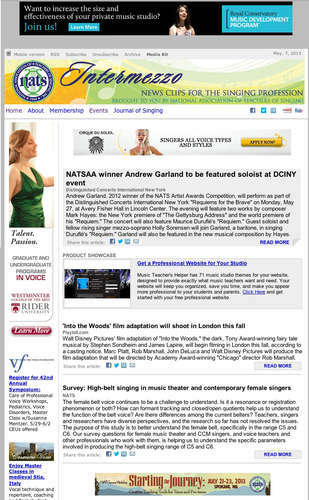 Intermezzo, powered by Multibriefs, is a weekly compilation of news clips about the singing profession, in addition to NATS news, that is delivered to each member’s inbox. Intermezzo tackles today’s most relevant issues, gathered from sources including The Associated Press, The New York Times, Financial Times and leading industry publications. It is delivered to the inboxes of teachers of singing in the United States, Canada and more than 25 other countries. Inter Nos is a semiannual e-zine publication that is delivered in the spring and fall. The e-zine provides important information about the work of NATS to its members. A major feature of each Inter Nos is the “Independent Voices” section, which is focused on the work of independent teachers. 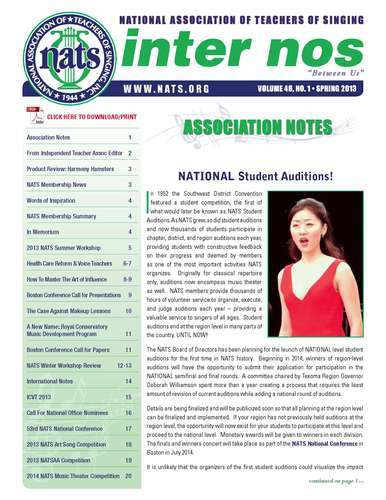 Issues of Inter Nos are delivered via e-mail to all members, are archived in the member section of NATS.org, and are distributed through social-media channels. Advertising: Various advertising options exist in Inter Nos. Advertising space is available in full-page and half-page sizes, as well as presenting sponsorships. Presenting Sponsorship (Two Issue): $1,200 - Consists of a front-page banner ad, a full-page ad within the publication and name recognition/Web link placement on even-page folios. Presenting Sponsorship (One Issue): $750 - Consists of a full-page ad within the publication and name recogition/Web link placement on even-page folios.